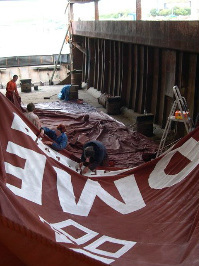 A necessary and very messy process undergone every 3 or 4 years to protect the sail cloth from the elements. We use a homemade concoction including fish oil, heated in a large barrel and applied with brooms! Not many people can fail to be stirred by the site of a Thames Sailing Barge in full sail. This is the only way you will see S.B. Edme as she has never had an engine. She is rigged and sailed by her crew in the same way as when she was built in 1898. It would be true to say that this was one of the attractions to her present owners, most of which came from sailing, and racing, traditional East Coast Smacks (ex fishing boats), it seemed a natural progression in 1989 to take on the Edme, and keep up these traditional sailing skills on a larger scale! In 1989 Andy Harman, Shipwright and Skipper, took her to his Boat Yard in St Osyth. Initial work began mainly rebuilding her starboard side, no mean task, but she was rigged and ready to go racing by 1992. In 2002 Edme decided to take on the challenge of loading aboard a cargo of 60 tons of variegated stone. Most barges today have been converted into living quarters below deck, but Edme still has her original hatches (and open hold), which can be removed for loading. This was an extraordinary event. Many skippers, sailing today, have had no experience of sailing a barge with cargo! Laying low on the water line, it was an important and great experience for all to see, and feel, how she responded to these conditions, and for which the barges had originally been built. The first barge to carry a cargo for over 30 years.